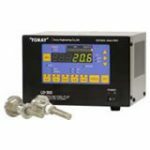 SW/LD-300 enables monitoring of oxygen partial pressure (depressurization status) in sealed chambers, circulation systems and other closed loop sampling systems, as well as measurement of oxygen concentration in inert gas flushing (pressurization status near atmospheric pressure). Since the detector is of the separate type, it can be set up near the measurement point. The LD-300 converter can be combined with various sensors and detectors, and the system can be used while changing sensors and detectors to suit the application. Must not contain flammable components,halogen,silica,corrosive components or water doroplets. Please consult with us separately if the gas is composed mostly of helium. *1 The sensor is corresponding to NW flange for vacuum (16, 25, 40) or threaded type (3/8R). Please choose between them according to use conditions. *Only one sensor/display combination can be selected.